Halloween is on Thursday and I’ve been hearing this song play for the past two weeks. It’s a staple. It’s necessary. It has to be played at this time of year! That’s why I had to make it the song for today. In 1983, Michael Jackson’s Thriller album made its debut. 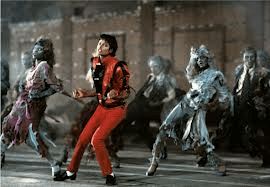 Filled with zombies, choreographed dance sequences, gore and Vincent Price, this mini-movie was the first video of its kind, spanning 13 minutes long and that zombie shuffled is still mimicked to date. Directed by John Landis, Michael Jackson transformed into a werewolf, essentially freaking out his date, but making for one heck of a music video. MJ changed the face of music videos 30 years ago, and they haven’t been the same since. 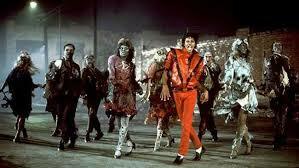 Happy 30th anniversary Thriller, Happy Halloween and Happy Monday!